How do you protect the timbers and joints where they are exposed to the weather? I noticed that exposed beams are common at the entryways to many homes. Hi Richard, thank you for your question. There are a couple factors that aid in the lifespan of exterior timbers. The first item is usually timber species. Certain species, like cedar, have natural oils present in the timber that aids them in resisting rot and effects due to the aging process. Only oak pegs should be used if there are traditional joinery elements – birch pegs (VTW’s choice for interior structures) often rot much faster than oak pegs. The most important aspect with exposed timber is to make sure it is exposed to air, so that it can dry if it gets wet. This is why exterior posts (and almost all interior posts) have a standoff to prevent the bottom from sitting on grade/concrete/in standing water and remaining wet. For the same reason, this is why timber posts should not be surrounded with masonry pier, but rather sit on top with a moisture break between the timber and masonry (i.e. galvanized plate). As long as a timber can dry fully following a rain, it should have a long lifespan. 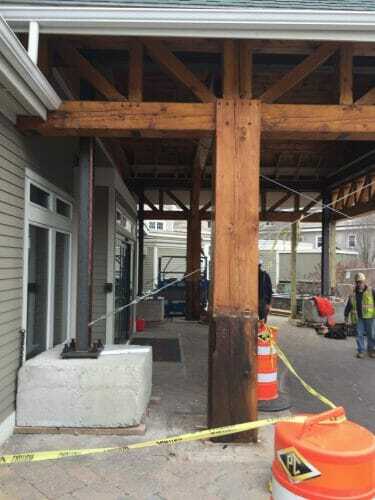 If you are interested in a visual of what a lack of air can do to a timber, check out our article of Rot in Heavy Timber Columns here. An exterior rated stain/polyurethane/sealant is also a key component – they help to protect the timber and can also enhance the look significantly over time. Occasionally a client wishes to have an exposed timber look (grayed and aged appearance), and that can be achieved with no stain and simply leaving the timbers to dry naturally. But if a certain appearance is desired, the stain/seal/etc. should be reapplied every ~5 years or so, depending on conditions. Lastly, end-gable trusses are often exposed to water from rain, even with a significant overhang. In these cases, all mortises should have a 3/8” weep hole drilled vertically down through the timber from their lowest part – this prevents water from accumulating in the mortise pockets, where standing water could rot the tenon, mortise, and/or peg resulting in a lack of structural integrity.